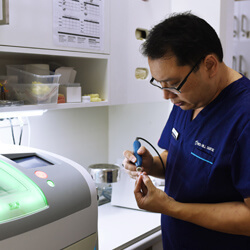 At Red Hill Dental in Paddington, our team of professionals are committed to providing you with the highest-quality dental care by using the latest dental technologies. We invest in state-of-the-art technologies to provide best quality dental products and services. The use of modern and up-to-date equipment ensures that you achieve the maximum results in minimum time. This also means fewer appointments for you, and that your dental appointments are much more comfortable. At Red Hill Dental we can create strong and natural-looking crowns, fillings, veneers and bridges in under 2 hours. 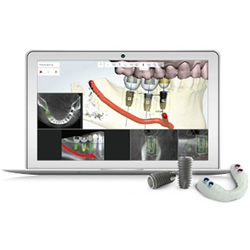 The digital device uses State-of-the-art CAD/CAM technology, a computer-aided design and manufacturing piece of equipment. This technology makes your dental visit more comfortable. It also means that you spend less time at the dentist. How it works: Dr Henry takes a digital impression of your teeth. With the computer-aided design technology we then create the new restoration in under 2 hours. Click here to learn more about how CAD/CAM technology helps to restore your teeth. Experience a revolutionary way to replace your missing teeth with DIOnavi digital navigation dental implant surgery at Red Hill Dental. With the use of a 3D computer simulation, we can determine the optimal way to proceed with your implants while minimising discomfort and maximising convenience. With DIOvani digital navigation, a small hole is all that’s required to place the implant. There are no messy moulds or impressions required. Our precise guide allows for the discovery of the safest and best path to surgery, determining the placement of your osseous tissue and nerves so that we can complete the procedure more effectively and efficiently. 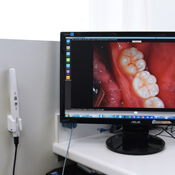 An intra-oral camera allows us to investigate your mouth and show you exactly what is happening, so that you understand your oral condition and treatment options. This camera is a small hand-held device that has a bright LED light. The camera connects to a computer screen which allows you to view photos or live video of your mouth. Zoom! Teeth Whitening is one of the quickest and easiest ways to whiten your teeth. In just under 90 minutes your teeth will be whiter and brighter. 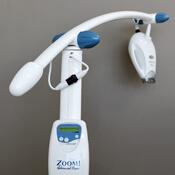 Zoom has been clinically proven to be safe and effective. It can whiten your teeth up to eight shades in just one application. Get the smile you want with Zoom Teeth Whitening. Lasers have been used in dentistry for many years. 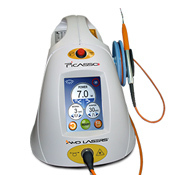 The soft tissue laser is one of the most helpful tools we use. A concentrated beam of light simultaneously cuts, coagulates and vaporises tissue with complete accuracy and precision. Sealing the blood and lymphatic vessels beneath the gum line, lasers significantly increase healing and recovery, as well as reduce the post-operative swelling, infections, and tissue scarring. Lasers decrease discomfort, accelerate the recovery process, and produce more satisfying and healthy smiles. Dental X-rays are an essential part of good dental care. 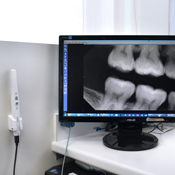 With the help of dental X-rays Dr Henry can examine what is happening in areas we cannot see, check to see if you have any active decay, diagnose potential damage caused from gum disease, access impacted teeth or abscesses, and plan your dental treatment. At Red Hill Dental we use Digital Dental X-Rays units. These units are safer than traditional X-rays units as they use less radiation. Digital X-Rays units also proven to be faster and provide more accurate diagnosis.